Since this films release in 1993, it has been shrouded in a cloud of political correctness that has kept anyone from criticizing it from a purely cinematic viewpoint. When I first saw this film back in 1993 in a sold out movie theater, I was completely blown away by the scenes of brutality and the cold, callous disregard for human life that the Nazi's possessed. When it was played on television for the first time in an uncut form with no commercial interruptions, I watched it again and felt that it wasn't as disturbing the second time. After I purchased the DVD release, and viewed it for the third time, I realized that on the whole it was a slightly above average movie, not an exceptional one. Had I become de-sensitized to the violence by repeated viewings? No, the reason that it didn't move me quite as much was the fact that it had been made by a director who was unequal to the task of telling the story in any other way but by shocking, startling, and repulsing his audience. Steven Spielberg has never been renowned for making good dramatic films; he's essentially a blockbuster B movie maker for the masses, and a very successful one. But when you take away his ability to use special effects, he resorts to cheap cinematic devices to tell his stories. For example, when the train of women & children arrive at Auschwitz, we see them having their hair shorn, followed by their removal of clothing as they are about to be taken to the ‘showers’. They are lead into the chamber, the somber, yet searing music intensifies, and we see the fear in their eyes at what they're anticipating. Then the lights go out, they start to cry and scream, and then...and then...the water starts to flow from the showerheads. Are you kidding me?!!! No director worth his weight in salt would dare use a ‘bus effect’ scene in a film that’s supposed to be a testament to the fallen. When I originally saw this film in the theater, I was repulsed by this moment of cinematic chicanery. What made it even more reprehensible was the fact that Spielberg discards all historical truth for this one ‘gotcha’ moment. It is a known fact that women and children that were sent to Auschwitz, never came back. No reprieve, they were killed…period. But it is something I should have expected from Steven Spielberg, who has never been anything more than filmdom’s version of P.T. Barnum. I've always wondered what this film would have been like if it had been made by a talented storyteller such as David Lean, Stanley Kubrick, or Sidney Lumet, directors who understand the word subtlety. Now I know that I will be incurring the wrath of all the P.C. sheep out there by criticizing this film and it's ‘wunderkind’ director, but this a movie, not an historical transcript. It is told from the Jewish perspective and recounts only atrocities inflicted by the Nazi's upon Jewish people. At the end of the film a caption appears on screen stating, ‘This film is dedicated to the 6 million’. One thing that has always bothered me about this and other movies about the Nazi death camps is how only the 6 million Jews are mentioned. What about the other 8 million Poles, Slavs, gypsies, homosexuals and mentally incompetent that were also put to death in the camps? When you fail to include these other tortured souls in the total, you inflict your own personal genocide by exorcising their existence. Please don’t get me wrong, I’m not saying that Schindler’s List is a bad film, I’m just stating that it doesn’t quite reach the strata of other films I’ve seen on the subject of the Nazi’s ‘Final Solution’. Claude Lanzmann’s Shoah, Adelson & Taverna’s Lodz Ghetto, episode #20 (Genocide) of the World at War documentary and Alan Resnais’ Nuit et brouillard had already shown the world the historical atrocities committed by the Nazi’s in their quest for racial purification. While the television mini-series Holocaust dramatized the events without passing itself off as historical testament. Should you see Schindler’s List? By all means, yes. But always remember, it is just a movie…a movie made to manipulate your emotions and nothing more. One last note; From time to time, I have heard people ask, how could the German people have been taken in by such a charlatan as Adolf Hitler? How they themselves would have never been swept up in the Nazi fervor that catapulted Hitler into power. To those people I say this; I have heard many people, on many occasions state, that everyone should be required to watch this film at least once, well... German citizens were required to read Mein Kampf. I know that my review will be visited by the scorn of some, as it did when I originally wrote it six years ago. I caught a lot of Hell for it on the DVDSpot forum, and I expect to get it again, but I felt my observations were true and that it deserved to be listed on this forum also. And I won't talk or write more than this about this subject. And I'm glad you did. I disagree with you, entirely, but still, mine is only other review on here of this film so it's good to see a counter-point. Matthias already expressed some critiscm after that so you're not alone and I doubt you'll be villified. It's not about being "politically correct" and I think that is a dreadful accusation on either side. However, you dismiss Spielberg as glibly as Tarantino! What rot. Yes, he is a showman, but the film has some incredible sequences all the better for how understated they are. The casual brutality of Fiennes' commander for one. And the present day segment is manipulative, but also quite beautiful and demonstrates the very soul of the film. But then, Jimmy, I thought the red coat sequence was devastatingly brilliant. You focus on the shower sequence and ok, yes, it is a "ta-da!" moment, but you go on to say no-one left Aushwitz alive? Actually, Spielberg did bend the truth by making it seem like they were there for a few hours... in fact they were there for three weeks, but they did get released because of Schindler. Your other major critiscm is one I have never been able to understand when applied to any historical film: what they didn't show. Steven Spielberg is Jewish and he wanted to make a very personal film about his heritage. To expand and show the equally brutal treatment and near extermination of other races would compromise his central message. To save one life, etc. Oscar wasn't saving the gypsies or the Poles, sadly he could only focus on what he did do. You treat this like Spielberg had some sort of duty, but he had no such thing. Finally whatever you think of the film, it's importance should never be underestimated. Maybe there are better films about the holocaust, but frankly, so what? None of those filmmakers were in a position to form The Shoah Institution for instance, which is very valuable. You can't judge Schindler's List as a film, or as art (though as both it is beyond reproach), it's legacy makes it exempt. 3.5 stars? Good grief! You do him a disservice. The whole film is a fine symphony. He used his power to draw in a typical blockbuster audience and gave them something they would never forget or dismiss. Not from me either. I think your review is pretty accurate, maybe even too forgiving. Should you see Schindler’s List? By all means, yes. But always remember, it is just a movie…a movie made to manipulate your emotions and nothing more. I agree. The problem is not so much Spielberg's mediocre movie, but the way it has been "canonized" as the ultimate Holocaust movie, used as teaching material in schools all around the world. That is what really, really disturbs me. He used his power to draw in a typical blockbuster audience and gave them something they would never forget or dismiss. Nonsense! (sorry, Jon) Of course the "blockbuster audience" can't be bothered to sit through 10 hours of Lanzmann's Shoah. Well, if they think the terrible fate of those millions and millions of people isn't worth that time, then they will have forgotten Spielberg's movie pretty soon after they had their oh-my-god-that's-horrible moment. A false sense of authenticity combined with kitschy melodram and happy ending - what Spielberg has created is the new Auschwitz lie. Thank you for mentioning that scene, it was the other moment in the film that drove me absolutely nuts. My response was more directed at all the films I've seen detailing 'The Final Solution'. The only film I've watched that even mentions the others is the mini-series Holocaust. Albeit in a sort of left-handed way. The sister of James Woods' character is deemed feeble-minded and gassed in one of the mobile CO trucks. She's feeble-minded, yet Jewish. You can't judge Schindler's List as a film, or as art (though as both it is beyond reproach), it's legacy makes it exempt. It's legacy makes it exempt! Sorry Jon, but when you give the film the look of WWII filmstock by using B&W tone to make it appear like an historical treatise, then you open yourself up to criticism. Have you ever heard the story of why Paul Revere is so famous in the US? It is because of the poem written by Henry Wadsworth Longfellow, The Midnight Ride of Paul Revere. Because it was such a successful bit of prose for its time, it has come to be regarded by a good measure of the population as historical fact today. Whose to say that in another hundred years, because of the way that it was made, that Schindler's List won't be taken as fact. Especially with generations of children being raised who have no proclivity towards historical curiosity and accuracy. When I originally saw it in the theater, I gave it 4.5 stars, but after the second viewing mentioned, I dropped it to 4 stars. When I finished watching it for the third time and wrote my review, it had slipped to 3.5, due to the reasons mentioned. I was going to write a prolonged diatribe on this statement, but Matthias summed it up best with his answer to it. That's unfair and flippant. "Can't be bothered?" Why should they? Drama helps people understand and connect, but if they have to put effort in, forget it. That's the way of the world. And the fact is, much as we movie lovers hate it, modern audiences don't like old, abstract, subtitled, b&w or god forbid, all three. Because it was Spielberg they gave it more than a chance. And to say they'd forget! You do have a dim view of the average person! I said that line in the last response specifically because of people I know who were a) affected by this film and remember it vividly to this day; and b) cannot in anyway comprehend why anyone would want to watch the before-said categories of movies (old, foreign, etc). Hmmm, a happy ending? No. Really, no. What I love about the story is that it demonstrates how much difference one man could make, but oh how rare that effort is. There's this contrast between the fact he saved 1100 people! But only 1100 out of millions. If there had been 10 more Schindler's, it still wouldn't have dented the awful total. I'm not happy about that. That doesn't give me a big grin. As for being concerned about the teaching material use, well on one hand it is used as a stepping stone to the Shoah foundation material, and that is more valuable than the film ten times over. Second, be a little more generous! My history education was woeful. 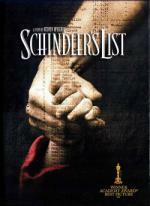 Schindler's List helped me realise the impact of the Holocaust and I wish I could have seen it while at school. So you'd rather the film not be made then. Because if that were the case, it would absolutely be a case of "Holocaust? What Holocaust?" by now. At least the film exists and had an impact enough to make people realise. Because I truly believe they do realise, where they wouldn't have from say, The Pianist. Note I am sticking with "mainstream". Internationally there is no point at all considering anything else as something future generations will pck up. Children should be taught how to put things into context, then all historical films could be used as stepping stones. Both you and Matthias are treating people like fools! Look, shameful though it is what with me living a couple of hundred miles from Scotland, I had no idea who William Wallace was until I saw Braveheart. Do I think he spoke with an occasional trans-Atlantic/Aussie accent? Well, obviously he did. Because that's what he sounded like in the movie. This isn't even the best film on this subject. Holocaust already mentioned by Antares is way better and credible, Escape from Sobibor (even if it had error also) is better, Night and Fog is better and I'm sure that many others are. And you bring me full circle. I don't mean to imply it is the greatest film ever or is faultless. When I say it can't be judged as a film, I mean that the general everyday audience won't see it as such. That's why it doesn't matter how much better or worse other films on the same subject are. You aren't going to see them on TV, but because it's Spielberg, because it was a success, you will see List regularly. And that's a good thing. I ask again, to all of you, would you prefer this film did not even exist? Because no other filmmaker in the last twenty years has even got close to the exposure Spielberg got for this subject. I ask again, to all of you, would you prefer this film did not even exist? Since it play with the historical facts and Spielberg wants his viewers to believe it's a 100% factual film that must be shown in school my answer must be yes. If the movie was presented as a movie and not a documentary my answer would be the opposite. When I say it can't be judged as a film, I mean that the general everyday audience won't see it as such. Which is exactly why I find Shindler's List problematic, but not Braveheart. And your Braveheart comment together with the one above exactly proves my point. No. Like Antares, I would prefer it would be treated as a movie. Just as I don't take Star Wars or the Princess Diaries seriously I see Schindlers List as a film... it may be historically in correct :S but its a film. I'm sorry Jon, but I have to red card you again. First, nowhere in my review or my responses do I intimate that I think the film shouldn't have been made. But I wish that it wouldn't be treated as some sort of Gospel according to Steven. Second, to say that by now we would have blanket acceptance of the 'What Holocaust' scenario is naive at best. With Auschwitz, Birkenau and Dachau still standing as memorial museums, the films taken by the Allies when they liberated the camps, the History Channel, PBS and the BBC still churning out documentaries on the subject, that scenario will never come to fruition.